There are very few superheroes who receive their own trading card sets and even less have devoted sets that aren't related to film franchises. Spider-Man is one of the lucky exceptions to appear in eponymous sets inspired by both the comic book and film versions of the character. Collecting Spider-Man memorabilia extends to several key options, including figures and comics, but Spider-Man trading cards are the sole subject for this article. 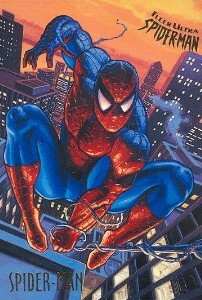 Shop for boxes of Spider-Man trading cards on eBay. 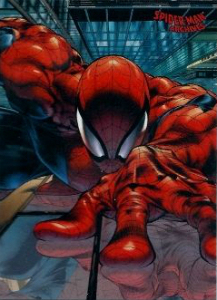 While there have been similar card-based collectibles, such as the 2014 Panini Ultimate Spider-Man sticker collection, only solo card sets are covered. This guide also sticks to sets released by major card companies and does not include small offerings included with cereal boxes or cookies. In addition, there have been several promotional releases, like the 2002 K-Mart set, but these are typically limited to just a few cards and are almost always cheap knockoffs of artwork used in other products. The following guide offers a complete look at the major Spider-Man trading cards available to collectors. Basic info is provided for each product and notable cards are referenced as applicable. Click on the listings or images to shop on eBay. When available, linked sets in the descriptions go directly to detailed product profiles. 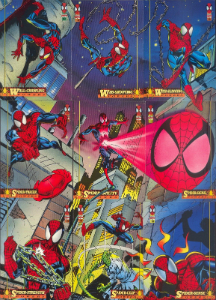 This 45-card set, commemorating the legendary revival of Spider-Man under the pen of Todd McFarlane, is the first cardboard option devoted entirely to the character. There are no chase cards in this set and no text on the back but the complete set does combine to make two black-and-white images on the reverse. The framing style of these cards was common during this time and also found on several sets revolving around other Marvel characters. 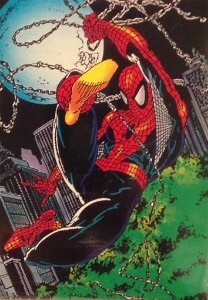 Comic Images released a second series of McFarlane cards in 1990. Again, the set includes 45 cards with a piece of a black-and-white line drawing on the reverse. The frame on the front of each card is different than Series 1 but very similar in style so it may be easy to confuse these two different sets. You will often find both series sold as one 90-card set and, since there are no chase cards, this is the easiest way to grab these cards. 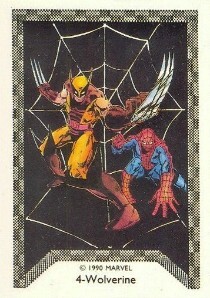 The second set released in 1990 by Comic Images was Spider-Man Team Up, which was a 45-card set inspired by the cover art of Marvel Team-Up. This comic title includes Spider-Man joining forces with another Marvel superhero for most of its 150 issues between 1972 and 1985. Although there are no chase cards in this set, there is a “cover card” that was included in packs but not part of the official checklist. The reverse of each card combines to make one large X-Men line drawing. Again, the framing of the cards is consistent with previous Spidey sets. 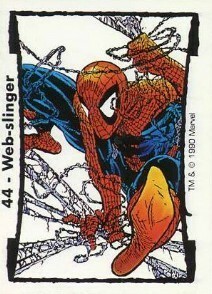 1992 Comic Images marks a real turning point in Spider-Man trading card sets, even if it is the third one inspired by Todd McFarlane. For the first time, each card in this set features a full-bleed, vibrantly colored image on the front and descriptive text on the back. The cards are of slightly better quality having been printed on heavier stock with a glossy finish. The set totals 90 cards, making it the largest single release to that point, and is the first to include a chase set of six prism cards. There is also a promo card available for this set as well as an uncut sheet of the chase set, which was a popular promotional tactic at the time. 1992 Comics Images 30th Anniversary may be a little confusing to collectors as it is branded as a second series but no first series can be found. Technically, the McFarlane Era is Series One of the 30th anniversary set because the prism chase cards are numbered P7-P12, picking up where the previous set left off. The text on each card serves as a retrospective of the character’s first 30 years in comic book history. This set is also 90 cards, of even higher quality than the previous release, and includes six prism chase cards, a promo card, and an uncut prism sheet. Many collectors focus solely on uncut promo sheets so these cards can be very difficult to find many years after release. 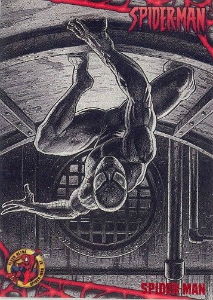 In 1992, Impel acquired the rights to produce Marvel trading cards but Comic Images still retained the rights to Spider-Man trading cards. Not wanting to miss the 30th anniversary of the character, Impel released a five-card promo set very similar in style to the broad Marvel and DC sets it was releasing at the same time. If you think that this would be a super rare set or of incredible retirement-worthy value, you’d be wrong as it can be found with regularity for under $20. However, it is still a must-have for any complete collector. 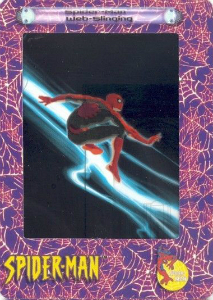 1994 Fleer Amazing Spider-Man looms large in the line of Spider-Man trading card sets because it makes some significant leaps and bounds forward in terms of art quality, card quality, and chase sets. The base set has 150 cards with the first 81 being separated into nine full-page mosaics of nine cards each. The chase sets were true chases because no single packaging type contained all of them. The chase breakdown includes two “Gold Web” sets of six cards each (and both numbered 1-6), with one being a Walmart exclusive and the second being a jumbo-pack exclusive, four hologram cards, and 12 suspended animation cards which had a character image printed on a clear window. Throw in a ton of promo cards from comics and trade magazines, and this set has a lot of cards to track down. 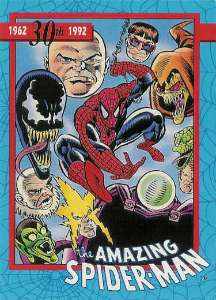 A year after releasing a mammoth set of cards, Fleer outdid themselves by doubling the size of 1995 Fleer Ultra Spider-Man. Along with the 150 base cards are a full autograph parallel featuring the signature of each card’s artist. Modern non-sport sets just don’t get this big anymore (for better or for worse) and this one also threw in four chase sets, including the nine-card Golden Web chromium set, six-card Holoblasts (a mix of hologram art and standard art), nine-card Masterpieces chromium, and ten-card Clear Chrome. All in all, there is a lot to collect with this set as well, but some of the artwork is really remarkable and a complete set is a worthy undertaking. 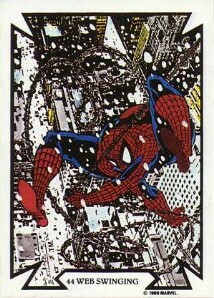 This 100-card set is probably the most visually striking of all the Spider-Man trading cards if you’re going chronologically. Taking a decidedly darker tone, maybe more reminiscent of the Batman Master Series than any of the preceding Spider-Man sets, these cards are of very high quality and, while not crazy expensive, sell for more than the average card set of the era. Some of the chase sets, however, sell for as much or more than an entire base set. The chase cards include a six-card canvas set and three holograms. 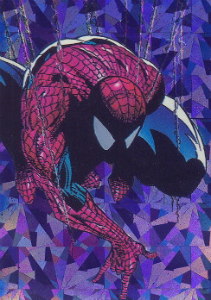 Fleer released three products in 1997 with one being a condensed reprint of their 1995 set and of little worth to anybody, the second being a set of cards in pre-priced $0.99 packages of little worth to anybody, and the 1997 Fleer Ultra Spider-Man, which is the only “real” set from this year. The 81-card set is divided into nine subsets each drawn by a different artist. The stylistic differences are striking and, when placed in a 3x3 binder sleeve, create nine very different pages. There is a parallel with blue writing instead of red and a very limited amount of sketch cards but no true chase sets like previous options. This release is a bit unconventional in design but offers a ton of artistic variety. Don’t let the name of this set fool you as 2002 ArtBox Spider-Man FilmCardz has nothing to do with the movie released in the same year. In reality, Artbox FilmCardz are designed in much the same way as the old slide projectors that many still have in their attics. The images of these cards are printed on transparent celluloid and then framed in plastic, making it possible to shine a light through the images and, conceivably, project them onto your wall. This set of 72 base cards, all featuring comic-inspired images, also includes two chase inserts of nine cards each. The quality of this product is questionable, with a slew of spelling and narrative errors and chase sets indistinguishable from the base set, but the novelty is worth checking out and a complete collection should probably include them. 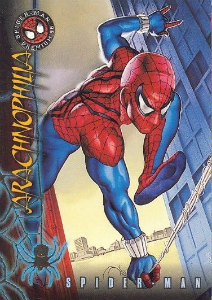 Released to commemorate the first film in the new Spider-Man franchise, the 2002 product from Topps includes 100 base cards with stills from the motion picture. There are a handful of chase sets, with ten glow-in-the-dark stickers, and several promo cards, including an SDCC exclusive. The chase options, along with the stickers, are a five-card Web Tech Foil set, five-card hologram set, and five-card Web Shooter set on clear cards for a grand total of 25 chase cards if you also get the stickers. The chase cards in this series are nothing to write home about, and Web Shooter is seemingly a copied version of the Suspended Animation cards from the '90s. 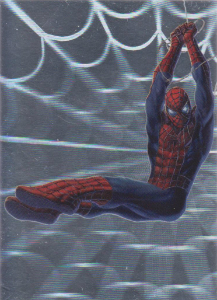 Cards for part two of the Spider-Man trilogy were produced by Upper Deck in 2004. This 90-card set includes an actual film frame relic in every box along with a lenticular motion card in every four packs. The design of these cards is a bit better than the Topps cards for the first movie but, ultimately, this is just another product of movie stills with interesting, but limited, chase sets. Rittenhouse was the third company to produce cards for the film franchise and their set coincided with the third film’s release. As is always the case with Rittenhouse, this set had a limited run of 7,000 boxes and, even more rare, a handful of case incentives, including relic cards autographed by J.K. Simmons. Also limited, six artists contributed sketch cards which were distributed to those who purchased three cases. The set has 79 base cards and 27 total chase cards (five total sets) that were each distributed 1:40. 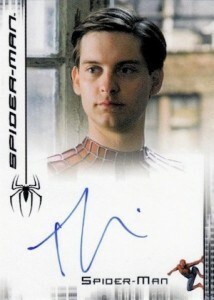 Every box also includes two autograph cards signed by various stars of the film, most notable Tobey Maguire. This may be tough to complete but patience will be rewarded with a quality set. Rittenhouse gave Spider-Man their full “Archives” treatment in 2009 with a 72-card set filled with extra goodies. Along with the base is a full foil parallel (1:4), nine-card Allies (1:8), nine-card Rogues Gallery (1:12), and nine-card Swingin’ Into Action (1:24). 99 artists contributed sketch cards for this set at a rate of one per box, and there are several case incentives that include highly-prized sketch cards and a 18-case incentive that includes a box of 30 sketches. Again, this set may be tough to complete but the artwork is stunning and the chase cards are worth chasing. For the reboot of the Spider-Man film franchise, Rittenhouse took a unique approach. The 2012 Amazing Spider-Man set is only 17 cards and purchased as a complete set. 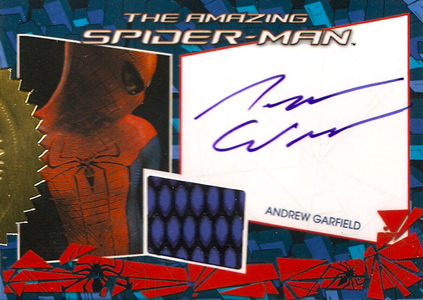 Each box includes one of two autographs by Andrew Garfield, the star of the film. So, in a way, the chase card is whichever autograph you didn’t get. There are also seven relic cards and nine character character cards. Only 444 of these sets were produced and an autographed relic card signed by Garfield was offered as an incentive giveaway with only 111 in existence. Good luck completing this set and be very careful not to mix your search up with the Rittenhouse Marvel Bronze Age set that also includes some Spider-Man cards. Fleer Ultra 2017 Spider-Man 1Buyback Memorabilia Card #58 Tarantula 16 30 SSP!